[Photo] Steller's Sea Lion (Eumetopias jubatus) bull. Date: 1978 July. Location: Middleton Island, Gulf of Alaska. Photographer: Captain Budd Christman, NOAA Corps. The Steller's Sea Lion, Eumetopias jubatus also known as the Northern Sea Lion, is a sea lion of the temperate eastern Pacific, named for the eighteenth century naturalist Georg Wilhelm Steller. It is the largest of the eared seals, measuring up to 3.3 m in length, with males weighing up to 1,100 kg while females weigh around 350 kg. Their coloration is lighter than in most sea lions, ranging from a pale yellow to a tawny and occasionally reddish, though they often appear darker in the water. The pups are born almost black and remain dark for several months. The range of the Steller's sea lion extends from the Kuril Islands and the Sea of Okhotsk in Russia to the Gulf of Alaska in the north, and down to A? ?o Nuevo Island off central California. They formerly bred as far south as the Channel Islands but have not been observed there since the 1980s. Based on genetic anаlyses and local migration patterns, the global Steller's sea lion population has traditionally been divided into an Eastern and Western stock at 144° W longitude, roughly through the middle of the Gulf of Alaska. Recent evidence suggests that the sea lions in Russia in the Sea of Okhotsk and the Kuril islands comprise a third Asian stock, while the sea lions on the eastern seaboard of Kamchatka and the Commander Islands belong to the Western stock. While the populations of the Eastern and Asian stocks appear stable, the population in the Western stock, particularly along the Aleutian Islands, was estimated to have fallen by 70-80% since the 1970's. 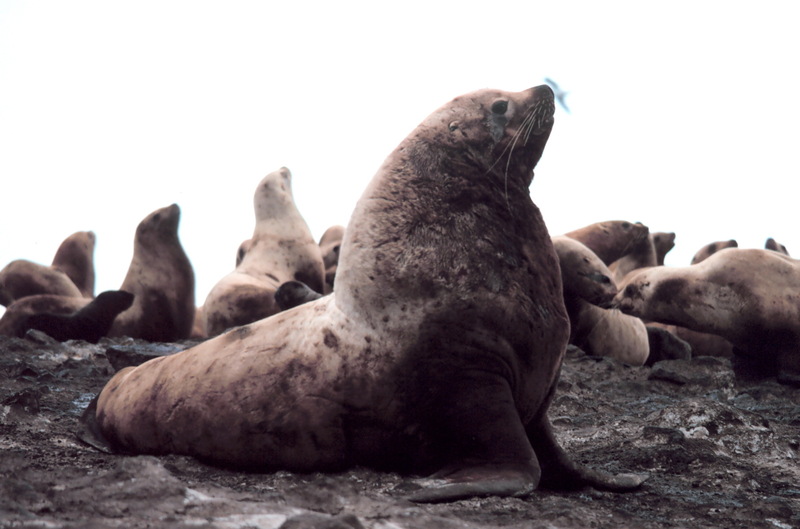 As a consequence, in 1990 the Western stock of Steller's sea lions was listed as endangered under the Endangered Species Act while the remaining populations have been listed as threatened. They have since been the object of intense study and the focus of much political and scientific debate in Alaska. Sea Lions are sometimes killed by fishermen as they are seen as competitors and a threat to fish stocks. As opportunistic and skilled marine foragers, they have been known to dive under long-line fishing boats, biting chunks out of the fish being hauled up and making them unfit for sale. Reproductively mature male sea lions aggregate in May, usually on beaches on isolated islands, to form reproductive rookeries. The larger, older males establish and defend distinct territories on the rookery. A week or so later, adult females arrive, accompanied occsionally by sexually immature offspring, and form fluid aggregations throughout the rookery. Like all other otariids, Steller's sea lions are polygynous. However, unlike most other species, they do not coerce individual females into harems, but control spatial territories among which females freely move about. Pregnant females give birth soon after arriving, and copulation generally occurs one to two weeks after giving birth. The fertilized egg does not become implanted in the uterus until the fall. Pups may remain with their mothers for several years. In fact, incidents of mothers feeding daughters who are simultaneously feeding their own newborn pups have been documented. Reproductive males fast until August, when the structure of the reproductive rookeries begins to fall apart as many animals leave for the open seas to forage or for non-reproductive haulouts. Occasionally this species is referred to as Eumetopias jubata. The Northern Sea Lion is also commonly named the Steller Sea Lion. The Northern sea lion is the largest of the sea lions. Males may be upto 310 cm in length and weigh around 900 kg. Females are much smaller, 200 cm (291 according to Loughlin and Nelson, 1987) and they can weigh upto 300 kg. The Northern sea lion is usually yellowish brown in color. The males have distinctive manes. Pups are dark brown during the first year. In the breeding season, the males form territories on rocky, semi-exposed areas and beaches. The range of this species is from the Sea of Japan at 43°N, north to the Pacific rim at 66°N and then south the North American Pacific coast to San Miguel Island at 34°N. Some migration seems to occur. On the Oregon coast, Northern sea lions and California sea lions live together in caves.